". . . 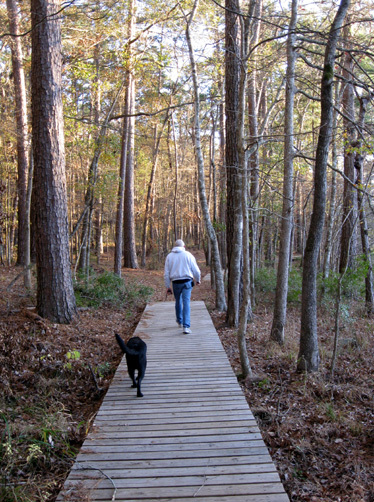 Located among loblolly and shortleaf pines, the park boasts an extensive trail system . . ."
. 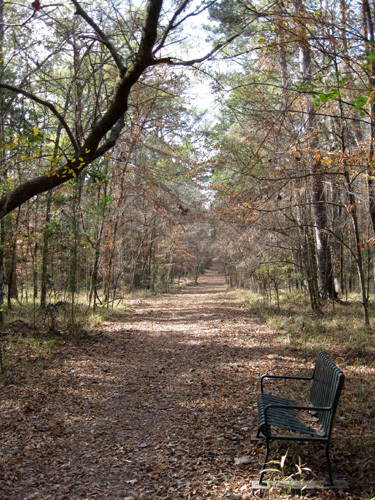 . . and if the 20+ miles of great multi-use trails within Huntsville SP aren't enough to satisfy you, head for the Lone Star Access Trail that exits the northeastern part of the park and meanders for about 129 miles in the adjacent Sam Houston National Forest! One of these years we'll have to check out this National Recreation Trail. 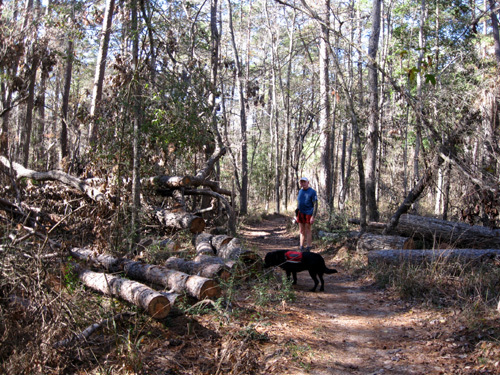 On this visit we didn't even have the time or energy to explore every trail within HSP, let alone the national forest. In the last entry I briefly described the three longest trails in the park (Triple C, Chinquapin, and Prairie Branch) and showed photos from several vantage points. In this entry I'll show more pictures from several training runs we did that covered various parts of the Sunmart 50K and 50-mile courses. Since both Jim and I are using Sunmart as a training run for ATY, we aren't tapering as we would for a goal race. I'll also talk more about our goals for this race and our training since the last update. 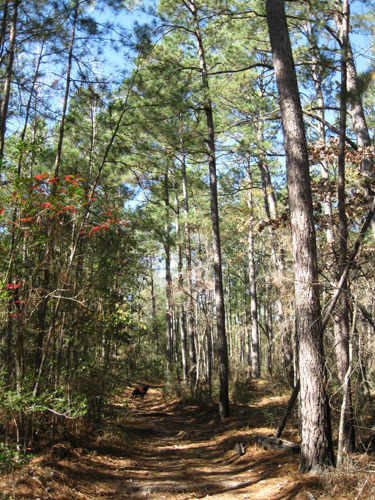 The 6.8-mile Chinquapin Trail, in orange, encircles Lake Raven. 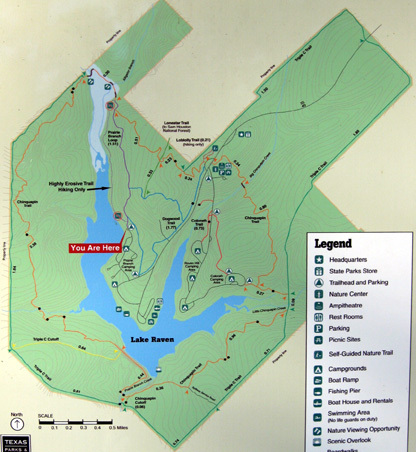 The 9.5-mile Triple C Trail (green lines) hovers close to the park boundaries most of the way. The 1.5-mile Prairie Branch Loop (purple) is just above the "You Are Here" marker on the map (this map is at the trail head next to our campsite). 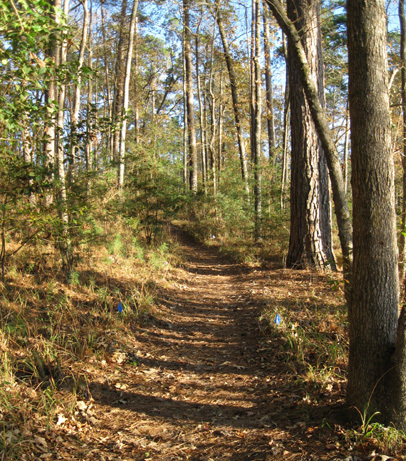 And the Dogwood Trail is in blue; we run on less than a mile of it where it parallels the park road. Jim and I wanted to become familiar with the trails used in the Sunmart races before Saturday. Even though we've both run the 50-miler, and Jim's done the 50K, it's been a while and many race courses do change some over time. This year, in fact, the first loop of the 50K was changed only a few days before the race. 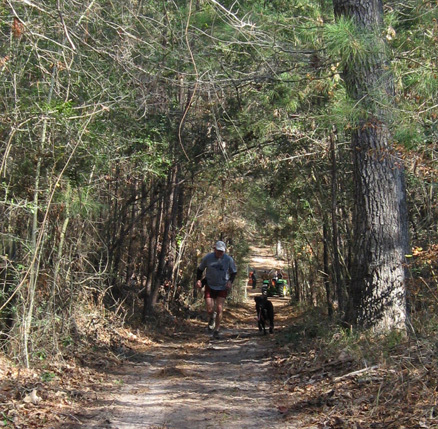 Two major running events are held in Huntsville State Park: Rocky Raccoon 50- and 100-milers in February and Sunmart 50K and 50-miler in December. 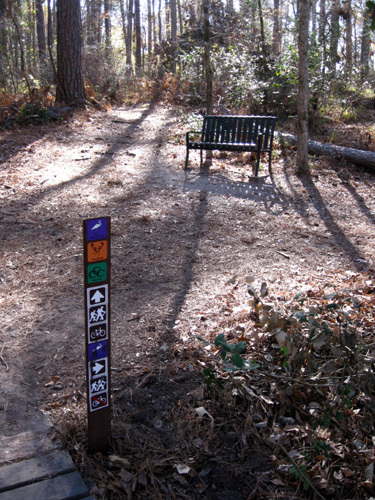 They are organized by two entirely different groups and use the trails differently. All four races start and end at Raven Lodge, the site of the largest aid station and the turn-around point for each of the multiple loops that are run. This is also the only drop bag location in the Sunmart races and the main crewing/drop bag location for the Rocky races. 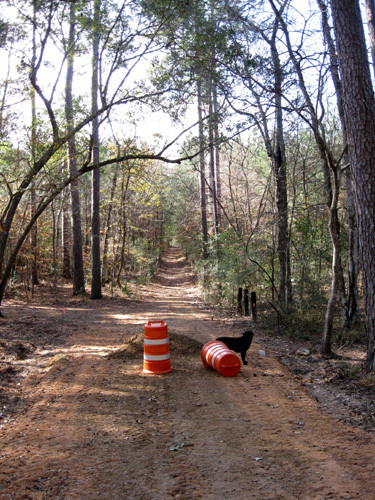 Rocky 100 incorporates parts of the Chinquapin, Triple C, Prairie Branch, and Dogwood trails in five 20-mile loops. Fifty-milers at Sunmart run parts of those same trails but in a different 12.5-mile configuration, repeated four times. 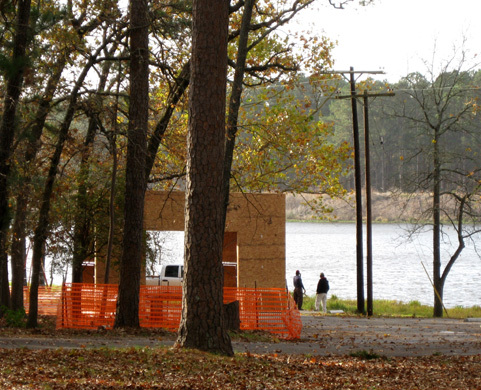 The Sunmart 50K has a 6.7-mile loop at the beginning, then a longer loop (about 12.2 miles) that is run twice. If you're interested in more details about either set of races, check out the course descriptions on the race web sites. There is a stylized map of the Sunmart courses at this link on RD Roger Soler's website. It's a pdf file and may take a little while to load. Jim ran the 20-mile Rocky loop several times back in February but had forgotten parts of it. I also ran some of the trails in the park in February but was on the Rocky course only in the dark while pacing Jim. We figured it would be good to have some familiarity with the Sunmart course loops we'd be running. We covered them in three training runs this week. 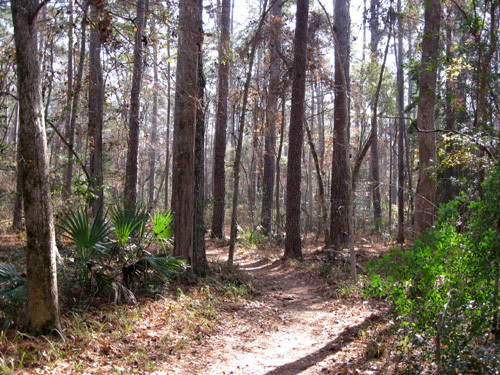 The Sunmart 50K has three loops of varying distances. 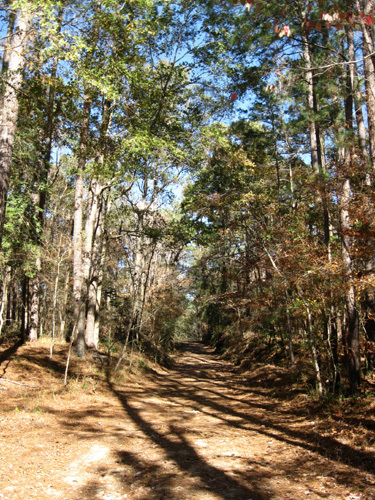 It uses the Triple C trails more than the 50-miler because the wider trails can better accommodate the 500-600 runners in the shorter race than the single-track Chinquapin Trail. 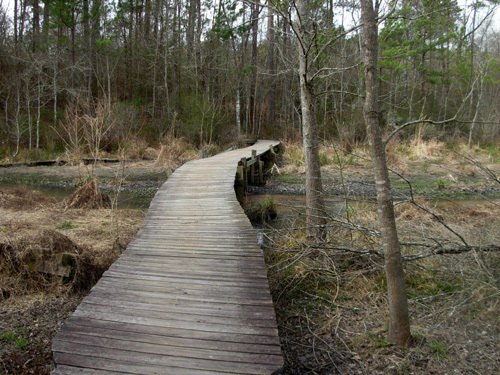 The 50-miler has four identical 12.5-mile loops that are run predominantly on single-track trails (Chinquapin, Prairie Branch, and Dogwood) with an out-and-back section on the Triple C Trail. The photos in this entry are mostly from the 50K course. If a section is used exclusively by one race and not the other, I'll mention that. Although Jim is registered for the 50-miler, he has decided to switch to the 50K at packet pick-up tomorrow. Some races allow this, some don't. Sunmart not only allows runners to switch races the day before the race, it also allows race registration on the day before the race. That's pretty rare for an ultra these days when some races meet their runner quota in a matter of minutes during on-line registration. Sunmart has no runner limit. There have been about 800 entrants in the race since we first ran it in 1998. Jim would like to get in a good 50-miler before ATY but he doesn't feel prepared for the pace required to finish Sunmart within the 12-hour time limit. He could probably do it, but he'd probably also regret it! And he doesn't need to be going that fast. This is our last long run before ATY. The closer we run/walk Sunmart to our intended pace at ATY, the better. Since the 50K has a very generous 11:15-hour time limit, we can go whatever pace we want and not have to hustle to beat a cut-off. We both have the same plan for after the race, too -- a fairly long run on the same trails on Sunday. Double long runs have always been good preparation for us for races longer than 50 miles. If we go at our planned ATY paces at Sunmart, we should feel OK to do another long-ish run on Sunday. The reality is that I'm definitely not as well-trained as I hoped to be right now. I suppose I've said that many times before races, but this time my qualms about being able to finish the race (not just getting a decent time) are quite legitimate. A week after running faster than I should have to finish the New River Trail on October 10 (and still coming in nine minutes over the time limit), I strained my left hamstring on a too-hilly training run. It's been a problem ever since. I really backed off the miles for six weeks and only began running steadily again at Fort Hood last week. My leg didn't hurt walking or cycling, so I focused on long walks and bike rides. I also got more frequent massages and chiropractic treatment before we left home, did more gentle stretching, stopped using the quad and hamstring machines at the YMCA (because both hurt the hamstring), used the whirlpool, iced the area, and got a nifty little ProStim TENS unit from my chiropractor so I could "get wired" every day (the electrical stimulation is supposed to speed healing). at north end of Lake Raven. Sunmart runners turn right and run along the lake. Apparently all that rest and babying has helped my hamstring heal. I've finally been able to run and walk comfortably during several two- and three-hour workouts since we've been on this trip. However, I have no idea if I can do it for 31 miles without straining the muscle again. Since Sunmart has always been intended as a training run for both of us for ATY at the end of the month, I have no pressure (other than ego!) to do well Saturday. Time on my feet and Doing No Harm are paramount. I will drop out if the hamstring starts to hurt. Period. If necessary, I won't run another step until ATY, just to give it more time to heal. 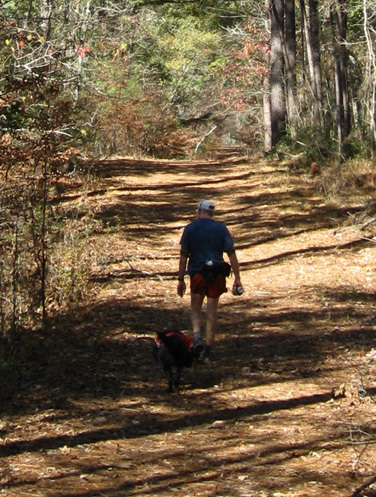 Jim and Cody walk along the lower Prairie Branch Loop Trail close to the lake. Figuring out how to prevent my hamstring from hurting at Sunmart is my challenge. I've gotten up to only three hours of running since I hurt it, longer just walking fast. Can I go another five or six hours (eight to nine total) with no pain? I have no intention of running as fast as I did at the New River Trail race. A 16- to 17-minute pace would be better training for ATY. I've considered walking the entire race at Sunmart but I don't know if I have the mental strength to do that. Seriously. It's such a runnable course and I want so badly to do some running . . . Thing is, walking the whole race might protect my hamstring enough to allow me to run more at ATY. I'd hate to get 25 miles into Sunmart and have it start hurting again (worse yet, 25 miles into ATY). to the aid station near our campsite. We're both looking forward to the race, seeing old friends, and making new ones. Unfortunately, there is no list of entrants on either the race web site or the race director's web site so we don't have any idea who is coming other than a few folks on the internet ultra list serve who have said they're running the race. At packet pick-up when we ran the race in 1998 and 1999 we received nice booklets with the names of the current year's entrants and the previous year's finishing times; we hope they've maintained that tradition.